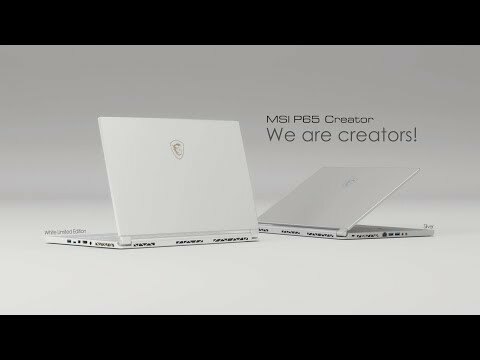 Designed and Built for CreatorsBe Creative with the MSI P65, a slim elegant laptop powered by a fast 8th Gen Intel Core i7 processor, a NVIDIA GeForce GTX 1060 with Max-Q Design and an ultra-fast SSD. Built for the creator, the MSI P65 is designed for work on the go. With an IPS-Level anti-glare display and a small 4.9mm bezel see more with less. The MSI P65 includes multiple ports of both the USB 3.1 Type-A and Type-C Ports and a HDMI for any external monitors and with a battery you can do all this with up to 9 hours of on the go usage. Go further and outperform the opponent An 8th Gen Intel Core i7 processor and ultra-fast SSD offer a smooth stress free work station, which provides excellent computer capability and instant boot up time. Watch as not only does the laptop boot up faster but look as your programs spring into life quicker and transition smoother when multi-tasking. Supercharge Your Laptop for Work and Play NVIDIA GeForce graphics deliver incomparable performance over integrated graphics. Scrub through timelines smoothly with real-time previews. Gear up and slim down with laptops designed with GeForce Max-Q. This innovative technology squeezes all the performance of NVIDIA GeForce GPUs into the world’s fastest, quietest, and thinnest laptops. Unleash your creativity Uniting the 8th Gen Intel Core i7 processor and the dedicated NVIDIA GeForce GTX 1060, maximise your gaming experience and set free your creativity with stunning photo and video-editing applications like Adobe Lightroom and Premiere Pro. the ultimate portable laptop Constructed with aluminium, the ultra-light chassis design is combined with white keyboard illumination. The P65 is made to be extremely portable and durable wherever you go. Enjoy the outstanding view across the IPS-Level anti-glare display and with the 4.9mm thin bezel which makes for a high screen-to-body ratio within a ultra small chassis. A fantastic Laptop Cooling Solution Exclusive Cooler Boost Trinity with triple enhanced Whirlwind Blade fans and 4 heat pipes stands out among the competition. Keep your laptop cool even in intense usage. Adapted for Multiple ActivitiesMSI exclusive True Colour Technology provides different modes to best fit your various usages. Unleash your creativity with stunning photo and video-editing applications like Adobe Light room and Premiere Pro. Sufficient ports readily available The MSI P65 provides up to 3x USB 3.1 Type-A Gen1 ports, 1x USB 3.1 Type-C Gen1, a RJ45 Connection Port,a HDMI port and Mini-Display Port in a small form factor laptop. The highly efficient USB 3.1 transfers 10x faster than USB 2.0. Power to keep you going The P65 laptop accompanies your non-stop lifestyle With over 9+ hours of on-the-go runtime, providing you with non-stop productivity alongside your work. CINEMATIC AUDIO EXPERIENCE Nahimic 3 Audio enhances your favourite music into virtual surround sound over your standard audio equipment and creates a cinematic experience even when at home. Quick and Easy Log In The built-in fingerprint sensor is designed for high privacy protection and business security. Logging in is as simple as a touch of your fingertip.